Lucky for guests at Town Lift Condominiums, we are located within walking distance from some of the very best food and drink establishments in Park City. We’ve compiled a list of our favorite walkable restaurants and bars to fulfill any craving! Everything listed below is less than ten minutes from Town Lift Condominiums. For a more extensive list of Park City’s dining and nightlife options click here. Its’ close proximity to Town Lift Condominiums and its’ irresistible charm make Atticus the obvious choice for your morning cup of joe. If you are feeling bold, skip the coffee and go for a “Goblet of Fire” (a cinnamon-spiced black tea latte). This cozy bookstore-coffee shop is perfect for people watching and sipping a hot beverage. 710 Bodega offers authentic Spanish tapas and an excellent drink menu. The atmosphere is charming, with a cozy patio for a relaxing dining experience. Try the Fried Brie Bites, Lamb Lollipops, and a glass of sangria. For dessert, you can’t go wrong with their decadent churros and chocolate sauce. Butcher’s Chop House maintains its impeccable reputation for being home to both a legendary steakhouse and an upscale bar. Butcher’s offers a variety of meats, game, seafood, and vegetarian dishes. In the summertime, patio dining at Butcher’s is highly recommended. 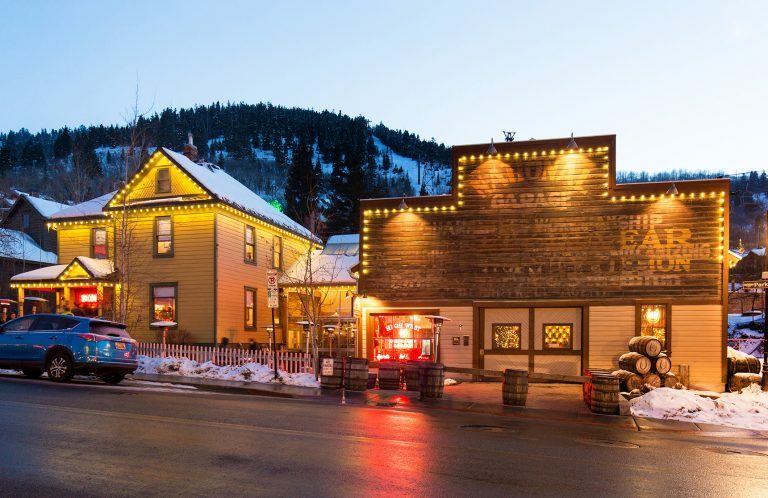 This historic ski-in distillery and gastropub first opened its doors in 1870 and remains one of the most popular hangouts in Park City. Located at the base of Town Lift, High West offers educational tours where visitors can learn how to make whiskey and vodka. The pub also has a full-service bar with a tasting room. A trip to High West isn’t complete without a whiskey flight so don’t miss out! This is your stop for delicious Thai food in an upscale environment. Expect huge portions and stop by for their happy hour, all-you-can-eat Pad Thai. The menu consists of standard Thai takeout dishes, but the ambience of the restaurant creates a more opulent experience. Bangkok Thai On Main also offers specials during off-season. Sometimes a cheesy slice of pizza is the only thing that’ll do after a long day on the slopes. Davanza’s is a family-owned establishment known for it’s delicious pizza, along with other comfort food favorites such as burgers, fries, tacos, and Philly Cheesesteak subs. With a casual vibe and friendly staff, Davanza’s is a crowd pleaser for both locals and visitors alike. Flying Sumo serves up the freshest sushi in Park City. The Park Avenue joint’s menu features unique sushi roll choices, such as “The Pablo Escobar” (ebi shrimp, cucumber and asparagus, topped with escolar and yuzu lime aioli) and “Empire” (coconut shrimp, unagi, cream cheese, avocado and cucumber with garlic eel sauce and spicy mayo). Be sure to take advantage of their seasonal 50% off sushi roll deal (weeknights only). The chefs at Handle pride themselves on using only locally-sourced and organic ingredients for their flavorful dishes. Diners can expect a menu of elevated American classics served as small plates (best enjoyed “family style”). Try their signature Buffalo Cauliflower followed by the Carmel Pudding for dessert and you won’t be disappointed. The Mustang delivers both five-star service and food. From the pre-dinner bread that arrives fresh from the oven to the generously-sized entrees, this restaurant is sure to please a hungry stomach. Be sure to order the mouthwatering Chocolate Souffle at the same time as your main course, as it takes 20 minutes to prepare. The first thing you’ll notice about Wahso is the Art Deco interior that is inspired by 1930’s Shanghai. In addition to the wonderful ambience Wahso provides, the food is equally as appealing. The chefs put modern spins on classic Asian dishes and are more than willing to accommodate dietary restrictions such as gluten-free, dairy-free, vegan, vegetarian. For an unforgettable dining experience, order the Wagyu Beef Tataki at Yuki Yama. With this menu option, diners get to cook their own meat on a 500-degree Himalayan salt block that is delivered to the table. If you’re not in an adventurous mood, the sushi at Yuki Yama will delight even the pickiest sushi aficionado. Don’t leave without trying the Bruce Lee Roll (albacore, spicy sauce, avocado, tempura shishito peppers, topped with lightly seared wagyu beef, crispy shallots, green onion, smoked sea salt, truffle ponzu)! This cozy Main Street lounge and restaurant was named after the owner’s rescue dog and created with the simple mission “to make people happy.” With their locally sourced menu and handcrafted cocktails, it seems as though the owners of Fletcher’s have succeeded in their goal. Relax with a drink in their Library Lounge or stop by to dance while a DJ spins on one of their “Fletcher Friday” events (check their website to confirm dates). Riverhorse on Main is a critically-acclaimed fine dining establishment for those looking to experience the finest dining Park City has to offer. Be prepared to spend a bit extra on dinner but rest assured that the cost will be well worth it. Try the Wild Game Trio (Elk, Venison, and Buffalo) followed by the Blueberry Cobbler for an indulgent dinner. If you’re craving a burger and beer, No Name is the place for you. This rustic bar is located conveniently on Main Street. Guests love their rooftop seating, whiskey menu and friendly locals to chat with. No Name is also one of the best places in town to watch a sports game. Make sure to arrive on an empty stomach and order their juicy bison burger. Chef Matt Harris calls Tupelo’s menu “globally inspired” but diners agree that it’s Tupelo’s Southern style biscuits with honey that make it worth visiting. Tupelo’s interior boasts a rustic vibe and their menu features fresh, regional produce. Visit the restaurant for Sunday brunch and experience their all-access Bloody Mary Bar. Cafe Terigo is a cozy, Italian spot that is perfect for a casual meal. For a deliciously satisfying lunch, order the grilled chicken breast sandwich (tomatoes, basil, mozzarella, balsamic reduction on ciabatta roll) with a side of sweet potato chips. In the wintertime, visit Java Cafe & Bakery for a gourmet hot cocoa. In the the summertime, Java is the best place for homemade ice cream in town. Don’t forget to try their freshly-baked waffle cones with the ice cream flavor of your choice! Java is also a great spot to grab a cup of coffee to go. The Spur is open 7 days a week and hosts live music of varying genres every night. Stop in for a cocktail made exclusively with local spirits (we recommend the Jamaican Wake-up if you’re looking to dance all night!) This bar is the perfect spot to eat, drink, dance and be merry. The atmosphere is upbeat, and the wings are absolutely delicious. Make The Eating Establishment your go-to joint for mouth-watering comfort food. This restaurant serves breakfast classics such as steak and eggs, french toast, and eggs Benedict all day long. In addition to their all-day breakfast menu, The Eating establishment also serves lunch and dinner, consisting of sandwiches, salads, burgers and more.